← Are You a Christian? Debate Day in the U S A ! 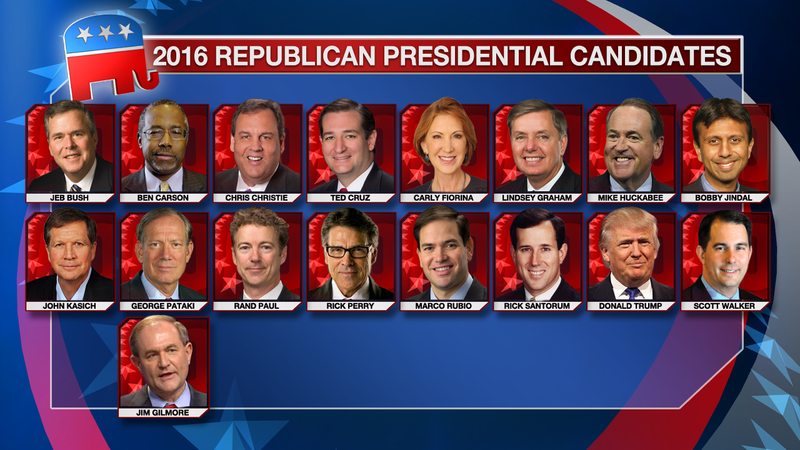 Here is the group of 17 Republicans running for the presidential nomination in the 2016 and tonight is the first debate. 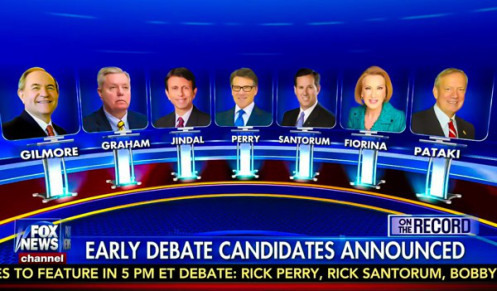 Well, there will be two debates. 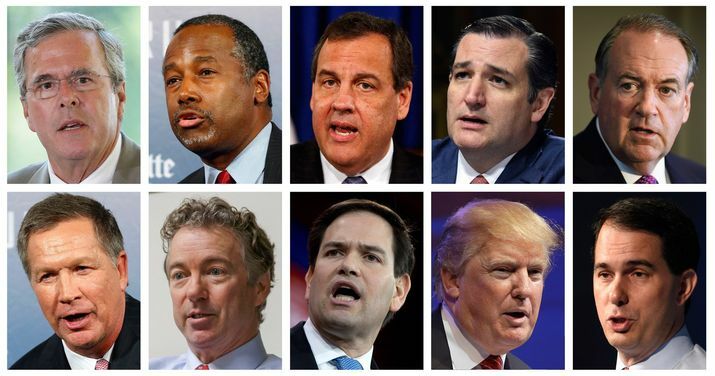 Here are the top 10 candidates based on the average of 5 poles. They will meet on stage in Cleveland, Ohio tonight at 9 PM. They will have the prime time slot of 9PM tonight set in a huge basketball hall in Cleveland Ohio where Lebron James plays magical basketball. 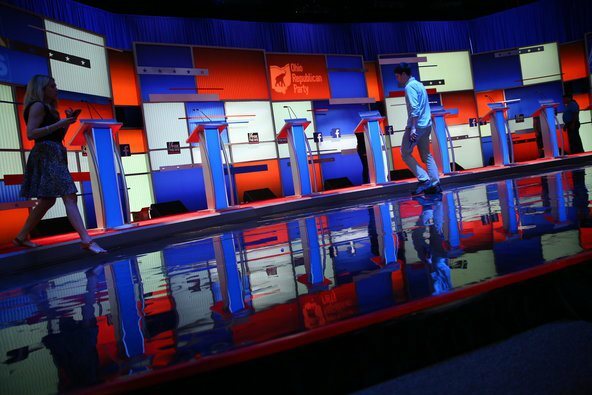 Here is the colorful set where both debates will be set. The questioners from Fox News. as they are sponsoring the debates. are excellent questioners, Bret Baier, Meghan Kelly, and Chris Wallace. There are comments that the debaters from the 5 pm debate may use live tweets to make themselves a presence during the second debate. Also there is talk that this might be the most watched cable program in history! Tune in if you are interested and able with time differences. Will LeBron James’ magic show up in a candidate or two? This Is the Beginning of the 2016 Election Cycle for President of the United States. This entry was posted in Uncategorized, USA and tagged 17 Republican Candidates, beginning of 2016 election cycle, Cleveland Ohio, Republican debates for President. Bookmark the permalink. 20 Responses to Debate Day in the U S A ! You know something Ann? The election goes to the highest bidder, not the person who is best for the country, so I personally would rather watch a game. We have been so apathetic for so long there are just no rights left, and the person who sells his soul to big commerce and foreign countries will be the one to be nominated. I always vote, but there is never anyone worth voting for any more. Whew my friend, that is very discouraging. I know a lot you say is true. I guess my hope springs eternal. I am thankful we still the right and yes responsibility to vote. Yes, we do still have that right, but I am still afraid it will be taken from us before we have a chance to use it again. I hate to say that, but I’ve felt it since this administration came to power. I agree. I am hoping for different leadership ( well leadership) and party agenda after the next election. I wish TV would be banned from the elections, and the candidates would have to do the meet and greets again, and really get to know the People they will be leading, not as unseen faces, but as the reality of life as it is in this country. See the pain of hunger, homelessness, the jobless people who have given up because their jobs are all in foreign countries now. I also think there should be a limit to the number of times congress can be sent back. Elected one time, reelected one time, then go out and earn a living and retire on Social Security like the rest of us. I’m sure our Founding Fathers never thought that position would become a lifetime career, paid for by a foreign country, or they would have written the by-laws differently. Oh no TV, I am afraid that wi never happen. During the debate, people were encouraged to use their phones to vote just like American Ideal or the Voice. I do agree with huge amount of money spent. Terrible when there are so many needs! And term limits, you so eloquently described a perfect solution! If the Founding Fathers could have foreseen what would happen, but of course what has happened was written during the founding of the Earth, and the Flood that destroyed it the first time. In my own time we have gone thru so many changes that would never have been believed when I was a child. I would have never believed as a child that some day a man would walk on the moon. How are you doing, Angie? I’m taking life one day at a time Anne. Some days are better than others, and today is actually better than yesterday, but I keep wondering who will leave me next. Have you have deaths of loved ones? My last Uncle in May, a grandson in June and my Mom in July. I have one Aunt still living, but still have grandkids. My grandson took his own life, and that is so difficult for us all to accept. Faith is sustaining me now Anne. That and my memories will keep me going, with a lot of prayers and help from friends around the world. I’m getting stronger physically, and I know I have to keep working on that, so that is keeping me going now. Bless your heart! I am so you connected again. Let’s keep in touch. We will. I had almost shut my blog down for several months, but it is open again, and I’m using that as my therapy. Writing is very therapeutic . Your transparent sharing will be helping others, too! It really is therapeutic. I constantly lose myself in my writing, and was very surprised to find Mom had saved most of my published work in a file at her home. I didn’t even know she read it. She had clipped a poem out of a newspaper that was at least 40 years old, and saved that also. What a sweet surprise! So sad she didn’t tell she was doing that! Previous generations weren’t very demonstrative. I know. She would find contests and urge me to enter them, but then act like they were nothing special if I got an award. It was the same for every award I ever got in my life, and then I found these. But she was always surprised when I would tell my kids I love them as they left the house. We never heard that until her older years, after she heard us saying it all the time. At times the children have to teach the parents. Mine have taught me many things. That generation was not very demonstrative. David and I are amazed what good parents our children are to their children. I love you and big hugs were important in our family, too.